HOLY GUACAMOLE. GET READY FOR THIS! 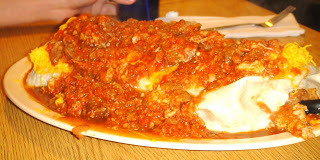 You may have heard about Manuel’s Original El Tepeyac Cafe from Travel Channel’s MAN VS. FOOD. It is home of the famous FIVE POUND BURRITO- “Manuel’s Special”. Authentic Mexican food at it’s best. Burritos the size of your face……take it back—burritos the size of a BIG, FAT newborn baby. Mayor Villaragoza who was raised in the Boyle Heights area, made El Tepeyac Cafe his last stop on his campaign tour for his reelection which was televised locally. This tiny Mexican hole-in-wall has gotten recognized in many press outlets, and is now a famously known Mexican spot in LA. At El Tepeyac Cafe in Boyle Heights/Downtown LA, you get the real Mexican food experience. I don’t want to say it’s in the “ghetto”, but let’s just say it’s not in one of the nicest of areas in LA. Always busy with a line, you can either eat in the tiny restaurant, or for faster service you can order on the side of the restaurant from the window and sit at the few tables outside. The portions are HUGE, so best come with a BIG appetite. This tiny hole-in-the-wall was packed. I just saw huge burritos and monsterous dishes on every table. Mostly everyone in the restaurant was Mexican- a good sign for good Mexican food I guess lol. All over the walls were pictures of press articles and Man Vs. Food’s host Adam Richman with the owner Manuel Roja. I ate in the restaurant and the service was fast and efficient. Our food came out quickly, and let me just tell you, it was a sight to see. Like their portions, their menu is big as well with plenty of options to choose from. ~Quesadilla De Asada- So good! The tortilla was grilled fresh just the way I like it. Lots of carne asada steak meat inside and very flavorful- plenty of melted cheese too. We got a side of fresh guacamole, and with their freshly made salsa verde and salsa roja, the quesadilla was perfecto! It was a definitely BIG too. ~Machaca Burrito- JEEZ MUF*CKIN LUIZ. This burrito was huge and packed with all sorts of good stuff. Guacamole, rice, beans, plenty of gooey cheese, onions, a fried egg, and Machaca which is shredded beef. The Machaca beef was great- super flavorful, and lots of it! The buritto was wet on top of a flavorful/spicy “stew” with peppers, jalepenos and onions. With the salsas verde & rojas, there was so much going on with this burrito, and it was damn good. My mouth was on fire from all the spicy, and I loved it! The guy next to me ordered a burrito for 4 people all to himself! I didn’t wait to see if he finished it but my guess is, he has leftovers for the rest of the week lol. This burrito was half my body! TOO MUCH! This server has a full plate on her hands…literally! This burrito is half the size of her! If you want good Mexican food and burritos the size of Shaquille O’ Neals foot lol, then try El Tepeyac Cafe. It’s quite the experience!